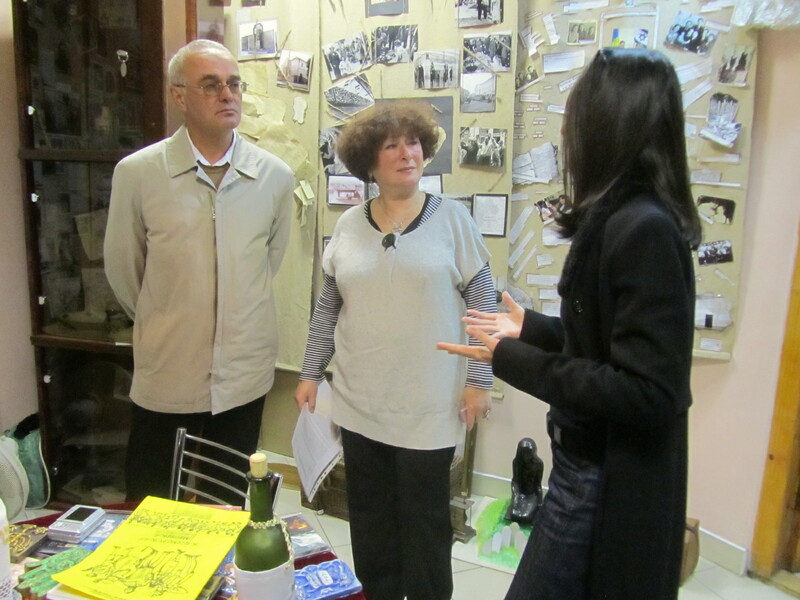 Yesterday Jay and I went with group member Alex Denysenko to meet with Hesed-Arieh (Lviv) Director Ada Dianova about having her on-site Museum accept donation of the box of Rohatyn Jewish papers collected by the Director of Rohatyn’s Internat (Boarding) school. (You will recall that the fate of this rare and important collection of papers from the Rohatyn ghetto during the Nazi occupation was one of the subjects discussed in my last report to the group dated 12 October 2011). 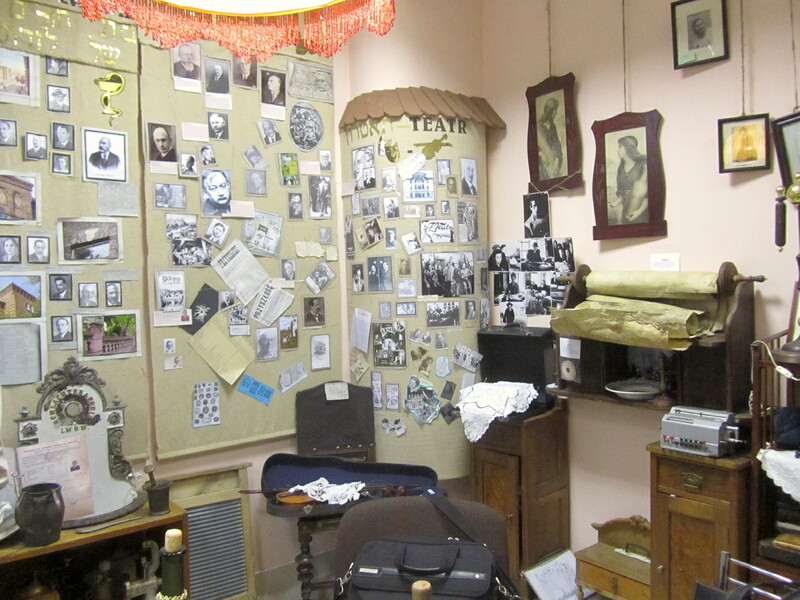 The Museum at Hesed-Arieh is small but rich – it not only has many artifacts from Jewish daily life in Lviv before the War, but also newspapers and photos from all over pre-War Galicia. There is also an extensive library of books upstairs. Because the Museum is Galicia-focused (and not just concentrating on Lviv), the suggestion was made during our most recent Rohatyn visit with the Internat Dierctor for him to donate the box to Hesed-Arieh, rather than continue to keep the box or to donate it elsewhere. I strongly agree that donating the box to this Museum is appropriate. Furthermore, by advance arrangement with the Museum, it is my understanding from Ms. Dianova that the box can be made available for examination to anyone coming to visit; and since almost without exception anyone in the group coming to Galicia to visit Rohatyn is also likely to stay and/or visit Lviv, the location of Hesed-Arieh in Lviv is convenient. Alex and Marla with Ms. Dianova. Photo © 2011 Jay Osborn. In addition, Ms. Dianova said her staff is experienced in scanning delicate and brittle papers and has the equipment and supplies to do this, with some planning. It is my hope that once the box has been donated by Rohatyn’s Internat Director next month, we can then make specific arrangements for the scanning process to begin, whether by using someone on the Museum staff or someone external, such as Alex Den. Ms. Dianova has also agreed to personally contact the Director of the Rohatyn Internat to coordinate the date of his visit and donation of the box. Alex Den has agreed to represent our group should this happen after Jay and I have already left Ukraine. One corner of the museum at Hesed-Arieh. Photo © 2011 Jay Osborn. With Olga at the museum. Photo © 2011 Jay Osborn. While studying the hundreds of miscellaneous photos on the Museum walls, I noticed the one we all know of the Rohatyn Faust family klezmer group! 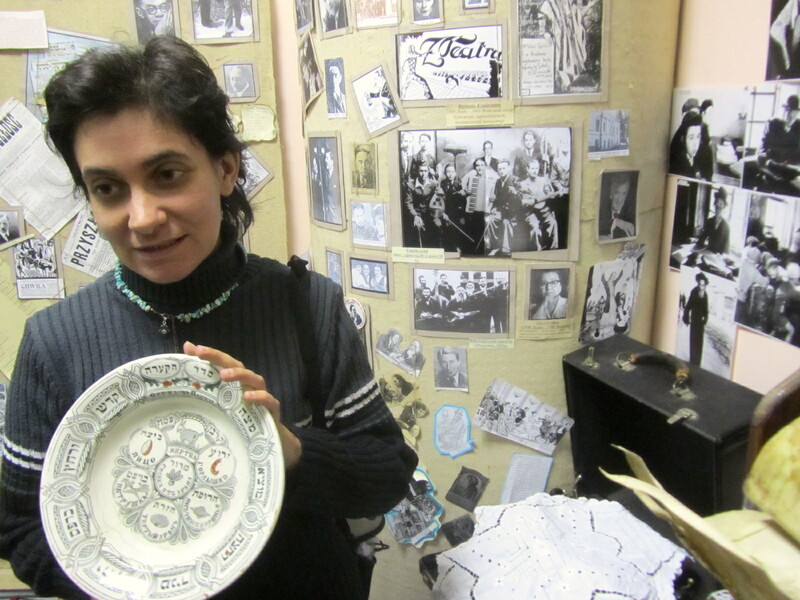 Furthermore, our Museum guide Olga said that there are several past exhibits that remain in storage at the Museum, one of them inspired by the memoirs of Rohatyn group member Julian Bussgang. Julian’s name came up following the discovery of the Faust photo and my subsequent explanation that there are several members in our group with Lviv family connections, including mine. 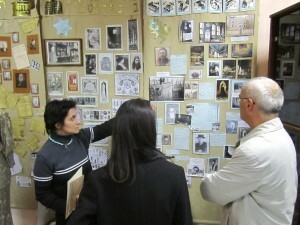 It turns out the Olga personally prepared this exhibit herself using Julian’s book, and she promised to search in storage and shoot photos of the exhibit panels for us. I strongly encourage anyone who comes to Lviv in the future to go visit the Museum at Hesed-Ariel. It is located at vul. Kotlyarevskoho 30, Lviv. And, of course, the Museum can always use more money to fund projects and exhibits. Should you wish to make a charitable donation, I have attached their bank information for wire transfers below. Please note that donations should be labeled “for Heritage Donation” to make sure the funds are directed as donation rather than as payment. On behalf of the group, I also wrote and mailed yesterday to the Director of the Rohatyn Internat a letter expressing our appreciation for his foresight in saving from destruction the Jewish papers discovered during the recent renovation of the school buildings. Many of these papers, you will recall, are scraps of hand-written notes, and a few show clearly recognizable surnames (Liebling, Lichtgarn, Huber, for example); others appear to be from torahs, Jewish bibles, and Polish and German language newspapers; one piece of stationary says “Rohatyn Judenrat” at the top. Rare survivors from a terrible time. Once we learn that a date has been chosen for the donation of the box to the Museum, I or Alex Den will report again to the group. The first week in November was raised in our discussions last week with the Director of the Rohatyn Internat; Jay and I leave Ukraine 10 November. Copies of the letters to Ms. Dianova and the Director of the Rohatyn Internat have been provided to Alex Feller and can be made available to anyone in the group, upon request to him. 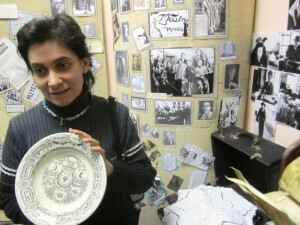 Olga with a treasure in the museum. Photo © 2011 Jay Osborn. I promised to write to Olga today and provide her with a number of photos and Rohatyn-specific documents (I will limit them to my Horn family), plus links to websites with Rohatyn information and other photos and records, such as JewishGen’s Shtetlinks page for Rohatyn and our Rohatyn trip photos. Both Olga and Ms. Dianova expressed an interest in having a small exhibit specific to Rohatyn on one of the Museum’s walls. ← Вчорашня поїздка до Рогатина: 12.10.2011 р.